Albert was born in 1867 at Quarry Bank, Cradley Heath, Staffordshire to parents James and Mary Ann. At the time of the 1861 census, James was working as a mill-man in an iron works. Albert operated a successful mineral water business. Albert was organist in one church for forty years, served as choirmaster, Bible class teacher, class leader, and local preacher. He was also treasurer and secretary of various funds and committees. Albert was very influential in replacing the Quarry Bank Chapel that was shaken to pieces by subsidence from the mines beneath it, with a new church, at a cost of some three thousand pounds. 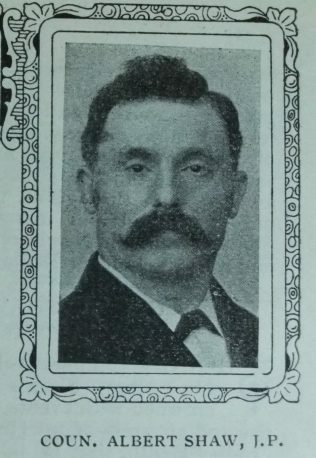 Albert was Vice-President of Conference in 1916. Albert visited Africa with Rev H J Taylor to bring back first hand reports of the missionary activities being carried out. On his return he was a persuasive, convincing missionary advocate. Albert was a keen educationalist. He advocated and worked for board schools, joined county committees and found his way onto the Educational Committee of Staffordshire County Council. Social reform was part of his religious life and he dealt with housing and labour problems from his youth. Albert married Esther Grosvenor (1865-1923) in the spring of 1888 at Quarry Bank, Staffordshire. 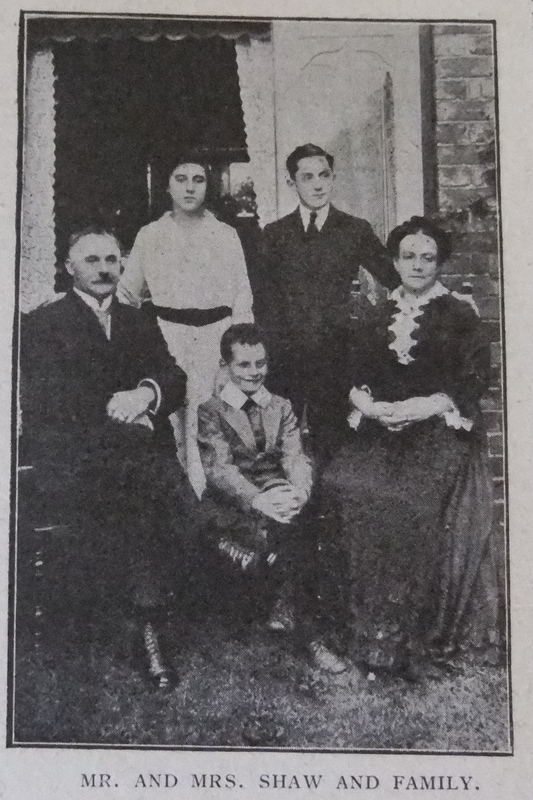 Albert married Jane Elizabeth Tolson (1879-1972) in the spring of 1924 at Quarry Bank. Jane was a head-teacher and Member of the Royal Geographical Society. She later moved to Leamington Spa and founded Southlands School. Albert died on 2 May 1924 at Kinver, Staffordshire. 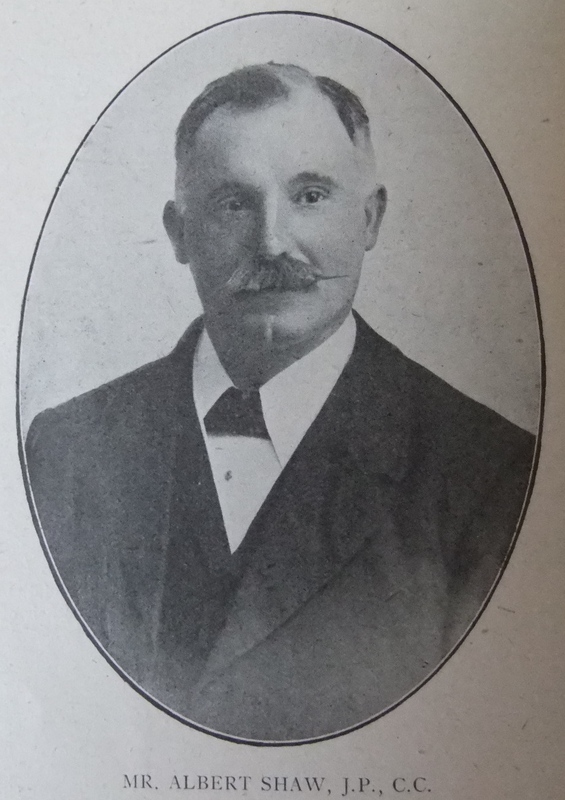 Though comparatively young in years Mr Albert Shaw’s life has been so crowded with events connected with the rapid rise and progress of our Quarry Bank Church, Cradley heath, that he is looked upon as an elder in experience. His father and mother cradled him with the songs of our Zion, and by example and precept taught him the first rudiments of noble living. At eight years of age he was made organist in succession to his father who held the post for thirty-one years. Our friend is still organist, and skilfully orders the service of praise. This is not surprising when it is remembered that he revels in the work, and will spend many hours at a time over this work. A member of our Church since 1881 and a local preacher for twenty-two years, he has filled many offices – trustee, Trust secretary, superintendent of the Sunday school, also its secretary, a teacher, band master, and society steward. In public life Mr. Shaw has played a distinguished part. Chairman of the Hospital Committee, the Light Railway Committee, president of Birmingham and District Mineral Water Trade Protection Association, member of Kingswinford Education Committee, and for four years chairman of Quarry Bank Urban Council, the marvel is that he manages to give so much time and thought to church work. District missionary treasurer for many years, he has also been a member of various Connexional committees, and is keenly interested in all Connexional movements. A good, fluent speaker, Mr. Shaw does himself and the Church credit in pulpit and on platform. His home is one of generous hospitality, and for him and his wife, whose own life in its own way is as strenuous as her husband’s, we wish many years of happy service.